My dad is coming to visit this week. This means two very important things are on my “what to make dad” menu. 1) Chili, always and 2) Caesar salad. Those are essential food groups for the guy. Anything else is icing on the cake. Plus, I always welcome the opportunity to use my huge bamboo salad bowl that we received as a wedding gift from our friends. When this bowl comes out, it’s something special! Even though Caesar salad isn’t traditional holiday fare, I totally think you can serve it as part of a holiday menu. I love an unexpected twist on the table personally. Do you have any non-traditional dishes that are go-to’s for your family? My mother-in-law used to always serve Caesar salad as part of Thanksgiving and Christmas dinner and I swear it was one of the things that went the fastest, next to her famous croquettes. And my dad, well…let’s just say his famous Caesar salad and chili make an appearance at every Christmas Eve and New Year’s Eve gathering. I’ve made a couple vegan Caesar salad recipes over the years (one of which is in my cookbook), but I think this version is my best rendition yet. Recipes are always works in progress for me and I find each time I make it, I’m always trying new things. In addition to a new dressing, I also added roasted chickpea croutons and a nut and seed based parmesan cheese. I used a blend of traditional romaine lettuce with non-traditional Lacinato kale (destemmed of course). This way you have the classic flavour of romaine with the nutritional boost of the kale, without scaring anyone away (ahem, dad). I love the two tone greens in the bowl too. It’s a great make ahead salad because you can prep everything the day before (except for the roasted chickpeas) and then just mix it up the day of your event! The first time I made this dressing, I actually used double the quantities you’ll see in the recipe below. However, I found that it made way too much (I had half leftover after mixing the salad), so I cut the dressing ingredients in half and it still worked out fine in the blender. I’m just mentioning this in case you are wondering about making a larger batch for a crowd – this dressing doubles beautifully! I had a lot of fun with the photoshoot for this recipe, so I’ll let the photos do the rest of the talking. And in case I’m not back again this week, I’d like to wish my American readers a lovely Thanksgiving! Thank you for coming here each week and eagerly trying out so many of the recipes I share. If you’re looking for my favourite Thanksgiving recipes, you can find them here. Also check out my 3 Course Step-by-Step Vegan and Gluten-Free Holiday Menu. This is a delicious, creamy vegan Caesar salad that will wow any crowd! Everyone who’s tried it goes absolutely nuts over it, and it’s my most popular salad recipe on the blog. To take it over the top, I garnish the salad with a generous amount of crunchy Roasted Chickpea Croutons and a delectable Nut and Seed Parmesan Cheese for the ultimate vegan Caesar salad. The dressing recipe easily doubles for a larger group and it’ll keep in the fridge in a sealed container for a few days so you can make it in advance. Dressing adapted from My Vega. Roast chickpea croutons: Preheat oven to 400°F. Drain and rinse chickpeas. Place chickpeas in a tea towel and rub dry (it's okay if some skins fall off). Place onto large rimmed baking sheet. Drizzle on oil and roll around to coat. Sprinkle on the garlic powder, salt, and optional cayenne. Toss to coat. Roast for 20 minutes at 400°F, then gently roll the chickpeas around in the baking sheet. Roast for another 10 to 20 minutes, until lightly golden. They will firm up as they cool. 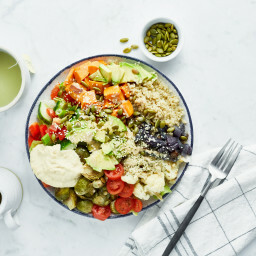 Prepare the dressing: Add the cashews and all other dressing ingredients (except salt) into a high-speed blender, and blend on high until the dressing is super smooth. You can add a splash of water if necessary to get it blending. Add salt to taste and adjust other seasonings, if desired. Set aside. Prepare the Parmesan cheese: Add cashews and garlic into a mini food processor and process until finely chopped. Now add in the rest of the ingredients and pulse until the mixture is combined. Salt to taste. Prepare the lettuce: Destem the kale and then finely chop the leaves. Wash and dry in a salad spinner. Place into extra large bowl. Chop up the romaine into bite-sized pieces. Rinse and then spin dry. Place into bowl along with kale. You should have roughly 5 cups chopped kale and 10 cups chopped romaine. Assemble: Add dressing onto lettuce and toss until fully coated. Season with a pinch of salt and mix again. Now sprinkle on the roasted chickpeas and the Parmesan cheese. Serve immediately. Be sure to check the label to ensure your Worcestershire Sauce is gluten-free (if necessary) as not many are. I use Wizard`s Gluten-Free Organic Worcestershire Sauce. The dressing thickens when chilled, so be sure to leave it at room temperature to soften before using. Would it be as good if I didn’t use sesame seeds? I am intolerant :( Is there another seed I could sub in? you could just use more hemp seed if youd like :) or another tbsp of cashews. I’ve made coconut bacon before (its great on this salad too) but never beet – great idea!! i’ll have to try it. Bake at 325F for 10 minutes, until the coconut flakes are golden. Turn on the range fan and open a window while it bakes as the smoked aroma is powerful. thanks! hope you like it if you try it out. Do you know if the hemp seeds would show up in a drug test at work? They shouldn’t. I’m not sure if it’s like poppy seeds, where you eat a bagel loaded with ’em the morning of and you test positive for opiates, so I wouldn’t recommend it the morning of a scheduled test, but it probably won’t show up. I’ve been eating hemp seeds for years, have had a few work related tests, and have had no failures. @Angela Do you have any recommendations for replacing the cashews in the dressing? My vegetarian sister, who also happens to have the same name as you :), is very allergic to tree nuts. I was thinking maybe a thinner chickpea and seed mixture, sort of like a slightly runny hummus, but my concern with that would be the taste. I still want to feel like I’m eating a Caesar salad, not a hummus salad. Any input would be highly appreciated before I start experimenting. Before I go, I just want to say that you are fantastic. You have so many creative ideas and well thought out and clearly written recipes. If I need an idea for vegan menu items, this blog is the first place I check. You are an inspiration. I have a tree nut allergy myself, and I usually sub sunflower seeds wherever cashews are called for. Their flavour is not overpowering so they tend to work pretty well. Eeeeek!! I can’t WAIT to make this with coconut bacon! What a wonderful suggestion for an addition. Thanks Angela! Oh this looks so rich and savory! I love salads but I haven’t been eating them lately since it’s winter. This looks hearty enough to fill me up and not leaving me wanting to nibble more. Holy smokes, this looks delicious. It looks so creamy and crisp – I can’t wait to create this one!! I love the addition of chickpeas! I’ve had one vegan caesar salad from Heirloom in Vancouver, and it’s totally sparked my love for them! Definitely can’t wait to give this a try. This is a great-looking salad! I am going to make it for a neighbourhood potluck in December. Plus my favourite homemade cookies (crispy cacao cookies). Thank you, Angela! I am sure my 2 kids and husband will love this salad as we often eat Caesar salad (we eat various versions of Caesar salad every 2 weeks or so). I make myself caesar salad for dinner sometimes. I’ve made dehydrated croutons with nut milk pulp and flax seeds, but I also love the idea of using chickpeas! Can you please share how you make the croutons with the leftover pulp. What a fantastic idea….Thanks! Thank you!! One thing I have missed being a vegetarian is a good Cesar salad. I will definitely try this!! Thanks again!!! This would be a great salad to add to our Thanksgiving day menu!! I can’t wait to make this! I am thrilled you posted this. My husband loves ceaser salad, and I’ve made the traditional dressing from scratch. However, I have long wanted a vegan version. We’ve both enjoyed cashew-based dressings/sauces, so we will absolutely give this a try. Though I don’t know much about finding vegan worst. sauce. . . will have to look around. Annie’s makes a vegan worcestershire sauce, if you are state side. Don’t think it’s GF though. I love the idea of adding kale for a more nutritious and beautiful two-toned Caesar Salad! Chickpea croutons look fabulous too! Love the use of chickpeas as croutons! I know some die-hard caesar salad lovers, so this would be great for them! Really nice recipe en lovely pictures. Makes me hungry! This looks wonderful and so tasty as well as filling! Chickpea croutons are such a brilliant idea! This salad looks amazing. I can’t wait to try it! YUMMMM!!!! My dad is also a caesar salad fanatic, and this would be a great recipe to get him to eat more nutritionally packed veggies in a way that he enjoys. I’ll have to save this for our Thanksgiving meal this week! Thanks! This looks super yummy, making me very hungry haha!! The chickpea croutons look amazing! Any suggestion on what seed would be best to replace the cashews for a nut free version if possible? I love this! i love the chickpea use instead of croutons! I made this for dinner tonight and added tempeh sauted in coconut oil. I couldn’t stop sampling the dressing, it is so good. The chickpea croutons and the cashew Parmesan all work so well together. I’ll definitley make this recipe again! Wow Angela, this looks so delicious. I love it! do you think instead of cashews you could use leftover almond pulp for the vegan parmesan cheese? Other than that this recipe looks amazing. Can’t wait to try it! Also, could you use avocado for the dressing as a nut-free alternative? Beautiful photography (as usual)! I am making your raw pumpkin pie for thanksgiving this year. first time making it. can’t wait to give it a try. I am completely obsessed with the nut and seed cheese on this salad. Making this asap! Pinned! This looks so delicious! I have one question – I can’t tolerate garlic and it does appear in this recipe three times, so do you think it would suffer a lot from the omission of the garlic? You did an amazing job with this photo shoot. All the colors. I love your countertops! What a great place to take photos… someday! I am living in Asia, and most kitchens here are not meant for family cooking. They are meant as a space for the maid to work, so are very untilitarian, and rarely have light. We did renovate our kitchen to make it a nicer space, but there wasn’t much we could do about the lack of lighting. I can’t wait to move back to the States and have a big America kitchen again! But– we’re on the 5 year plan. It’s hard to leave the careers we have here– more opportunity! Oh gosh; this look fantastic! I could see this being a staple salad around our house. Can’t wait to try it. I’m all over this – stunning, healthy, and soooooo yummy looking! Easy too….love! This looks so amazing! I now have one of my sides for my thanksgiving feast, thank you! I am drooling over this at my desk and it’s only 9am! I love the idea of a vegan Caesar dressing, do you think it could be saved in the fridge for day to day salads? I think it should last for at least 5 days (as it did in my fridge), possibly longer. I will definitely be making this soon; I love salads and could eat them every day! By the way I made your crispy smashed potatoes with garlic avocado aioli last night. They were so delicious!!! I especially love that aioli; that was so tasty! My son is allergic to cashews (and dairy… ) and a lot of your recipies call for it. Can you suggest an alternative? Thanks in advance for your help. PS Love your site! Hi Sonya, Sometimes soaked raw sunflower seeds work, but i cant comment for all recipes. its really trial and error! Hope this helps. Yes, I love a good Ceasar as long as it has no anchovies! That bowl is really beautiful too! Lol wow this looks amazing!!! oh myyyy goddddd. i pinned this immediately. i don’t know when i’m gonna make this. but i WILL make it. Thanks so much for posting!! Love you Angela! This looks amazing! Lovely photos. Delicious-sounding recipe, nice photos, and coolest. bowl. ever. OMG!.. Made this salad tonight and it turned out just like I remember Ceasar Salads!… Loved the chickpea crunchiness better than croutons since I’m not a bread lover! I have some leftovers.. I made enough of everything and only mixed just before eating.. Kept the ingredients separate for another one salad tomorrow.. Thanks Angela! This looks awesome! Do the raw cashews in the parmesan cheese need to be soaked overnight too? I bought raw cashews a month or so ago and never soaked them. Do they keep for a long time, or should I get more? I want to make this for Thanksgiving, so will have to soak starting tomorrow! Thank you!!!! no they dont :) enjoy! the dressing is super yummy! I am vegan about 60% of the time and your recipes are so helpful and inspiring! My nephew is allergic to Sesame, is there anything I can Substitute it w/ or would it be better to just leave it out? This is genius, Angela! The beat tasting Caesar salad I’ve had yet! Will be making this over and over. I’ve been going through a chickpea craze and this seems like a great dish to make! Yum! Hi Angela! I’m interested in making this salad, but I don’t really want to use capers if I don’t have to. Is it essential to the taste of this dish, or could I substitute something else? Thank you! Love your blog and your book! i havent made it without the capers so I cant say for sure. im sure it would still be tasty! I love this recipe. I’ve made it twice this week and everyone I’ve shared it with loves it, too. Thank you!! You really do have a gift! Yet again a wonderful recipe. I’ve just enjoyed a bowl for my dinner, so glad I have lots of leftovers too. It is always a good day for me when you post a new recipe. Thanks! I have to admit…I am not vegan but I LOVE this website (and the cook book). The ceaser salad was amazing! I couldn’t tell the difference between traditional dressing and the cashew dressing. I will be making this salad again! I made his for Thanksgiving today and it was so yummy! It tasted just like how I remember Caesar salad tasting. My Hubby loved it too! This will be a new tradition for our holiday! Thanks, Angela! Any suggestions for a sub for the worcestershire sauce? Made it for Thanksgiving dinner. Loved it! A very hearty vegan salad! First of all, I never leave comments or ratings on anything, but this salad was so amazing I felt compelled to. Dressing and parmesan topping can be made ahead. I made the mistake of roasting the garbanzo beans the day before and they lost their crunch, but they were fantastic right out of the oven. While I’m here I should also note that I have Angela’s cookbook and have tried many recipes on her website. I’m guessing we’ve probably tried around 50 recipes and there is only one I wouldn’t make again. Since going gluten free almost two years ago I have tried many different recipes from lots of different people and have had MANY fails and disappointments, but I can always count on Angela’s recipes to not disappoint. Hi Jennifer, Thank you so much for your lovely comment! It totally made my week. Thank you for all your support and I’m so happy this salad was a hit in your kitchen too! Wowww this looks so rich and equally creamy to the original stuff! I wasn’t into caesar salads, like, at all….until my husband made it from scratch a few years ago for a sweet romantic date. I was impressed and totally confused because he knew that the dressing includes sardines/anchovies? And i had no idea! lol. I hope you’re having a blessed and fun season with your beautiful family, angela! I’m a new reader of your blog and I’m really fascinated by your recipes. So much creativity! I especially love the idea of roasting the chickpeas. Normally, I only use chickpeas to make a hummus. But it seems there’s so much more possibilities. Keeping this recipe vegan is obviously just the icing on the cake. Wow, I have not been here to visit in years! You have a baby, congratulations! She is beautiful and you are glowing as usual! Just looked at your meals and used one in each day of my meal planning this week. Thanks for the inspiration! This Caesar salad was a huge hit! Everyone raved! I brought this to my sister in laws last night to go with veggie kabobs for me and meat for the rest. The SALAD was a HIT! I LOVED IT and so did my husband! Not a bite left. I will definitely be making this again, probably tonight! Just made it! A hit with the whole family…I hid some of it so I could have leftover for lunch tomorrow. Chili and Caesar salad – perfect combo for a Grey Cup party. I’m sure this will be a hit. Thanks for the idea. Oh my goodness this looks absolutely divine! Making this immediately. I definitely know what you mean about recipes never being quite finished–each time I go back to one I change it too! I’ve never been a big fan of Caesar Salad, and haven’t tried it for a few years since cutting out dairy, but I think I’ll definitely have to try this version-it looks amazing! Absolutely divine recipe…we were licking the bowl!! Thank you Angela! Can’t wait to roast up some chickpeas just to snack on. Amazing! Just wanted to ask you if you could recommend any of your recipes that would be a great DIY xmas gift idea ? I live in Vancouver and I wanted to make a bunch of different things and send them to my family in Toronto. I’m not sure which one of your deliciousness would make it through the shipping time – 7 days or so… I was thinking some granola maybe, nut butter? I would appreciate any of the recommendations! Totally trying this with our weekly spaghetti! This looks SOOOOOOO amazing. I am going to have to try it out. In fact, I wish I hadn’t already had lunch. Thanks so much for posting all those awesome pics. It will make it so helpful for me to follow along. This was so SO good! Such a keeper, thankyou! I love roasted chickpeas and never thought to use them as croutons. Brilliant! I’m so excited to make this recipe STAT! this looks incredible! I love the chickpeas! I love the Caesar salad in your cookbook, especially those nutty croutons, but am excited to try this one too. You Should’ve won the goodreads contest! So mad! hah thanks ;) Im grateful for all the support though!! Angela, I made your festive kale salad with cinnamon-apple dressing as a non-traditional green for Thanksgiving last week – it was an enormous hit! Even those who never voluntarily eat kale loved it! Thank you! So happy to hear that Rachel! Thanks for trying it out. I seriously looove every tasty aspect of this salad and chickpea croutons are pretty dang clever! I love that you used capers in place of anchovy paste. Why didn’t I think of that!? Ceasar salad is one of my favorites and I so appreciate such a clean eating version. Thank you! OK, this was the BEST salad ever! I made this for our family Thanksgiving and it was indeed a crowd pleaser! I’m the only vegan in the crowd but my brother in law asked me to send the dressing recipe to his wife:) Yum and thanks! I made this and it was delicious!! I especially loved the nut and seed parmesan. You are so creative with all your nut and seed parmesans! I made this for lunch Time and il Washington a big hit. The dressing os superb. Thank you. I loved this ceasar salad version the best so far! Made it for my family and everyone loved it! OMG, I made this salad this evening, it was absolutely delicious!!!! Thanks for the awesome recipe! Just tried your recipe and wanted to let you know it was great! I love it when traditional recipes are made “non traditional” and they taste as good as (or better) than the original! Gah!!! I am sooo excited to make this tonight! So far, every single one of your recipes that I have tried (over 20), have been wildly successful! Hi Angela! Made this last night for my mom’s birthday celebration and it was a hit!! Another touchdown recipe from your site ;) Thanks so much!! Can we take a minute for the fact that I made this and then ate the whole batch! Sorry not sorry, this recipe was phenomenal. I have been looking for a good Cesar salad recipe for years! Oh and the roasted chick peas? Genius. In the last five days, I’ve made this salad twice! I brought it over to a friend’s house, and I also just made it for my husband and I to eat at home. I haven’t had a Caesar salad since I’ve been vegan (~11 months), so it was absolutely wonderful. I didn’t eat a lot of Caesar salad before, but my mom made a kickass one, and I think it tastes very similarly. I left out the raw garlic, and I still think the recipe is fairly garlicy, so do watch out for that if you don’t like garlic. I don’t normally comment on blog posts, but I loved this one so much that I just had to. I have a goal to try everything from the OSG cookbook (I’ve probably made 25-30 recipes so far), but I decided to try this one instead of the Caesar salad in the cookbook since Angela raved about it so much. I’ll still have to try the cookbook one to compare. I just discovered your website and forget Julie and Julia, I want to spend next year cooking all of your recipes! I’ve been searching for the perfect vegan caesar dressing and this is it! I’ve made it twice now and the people I’ve served it to have gone nuts over it. Thank you! This was delicious! Amazing how you recreating the Caesar taste and creaminess in a much healthier and more flavorful dish! I made this tonight and it was a hit! It felt much more indulgent than my usual garlic/lemon juice/olive oil dressing. I was a bit hesitant about adding the kale as I only ever eat it cooked, but it added a nice level of bitterness to the salad and I’m sure many more vitamins! I didn’t have any hemp seeds to I used pepitas. It gave the parmesan a greenish texture but tasted great! Thanks so much Angela! Ooooh yum! I definitely will be making this. I’m pretty much obsessed with chickpeas! AMAZING! I’ve made this THREE times now. I added a little more mustard and garlic because I like it strong! Thanks Angela! I’ve been looking for a good dairy-free alternative to ceasar salad! Can’t wait to try! Made it twice. Love it!! Thanks for this recipe. Made this salad for lunch this weekend and both me and my husband loved it! I will definitely make it many more times! Is there a way to substitute something else for the cashews? Nut allergies in the family. Almonds are OK, but cashews, walnuts and peanuts are out. Any suggestions on making this oil free? My husband and I (both omnivores) really enjoyed this salad – I forgot to soak the cashews overnight so swapped them for tahini last minute. How would it have gone if I had used un-soaked cashews? Just made this. Absolutely delicious. After becoming vegan the hardest thing for me to still see people eat and not steal abite or two when they weren’t looking was ceasar salad. I’ve tried many raw recipies but somehow they came up short . This however Angela is SO delicious!!! Love the chickpea croutons as well! Thank you for sharing so much with others…you truly are an inspiration!! Which book includes this vegan caesar? Hi Sharon, It’s currently not published in any cookbook yet – just here on the blog! Thanks. This salad was soooooo good!!! My two little ones couldn’t get enough – they are only 2 & 5! And there were no leftovers. This was a huge salad and I loved that the dressing was the perfect amount – not too much, not too little. Doubled this recipe for a holiday potluck. Had leftovers which carried well, even when coated. I guess Kale can deal with the dressing without getting ultra soggy. Anyways, this was absolutely delicious and fun to make! The dressing was incredible. This was a hit at Christmas dinner! Thank you so much for creating and sharing this recipe! I did adapt the “parm” to my usual walnut/garlic/lemon zest/nutritional yeast version, since I had those ingredients handy – but the dressing I followed exactly and everyone from my caper-hating husband to my omnivore in-laws loved it! I made this as a New Year’s Eve treat for myself (along with the favorite chili recipe [which was also fantastic]) and this was by far – not a second of doubt in my review – the best caesar salad I’ve ever tasted. Forget all the recipes with chicken/shrimp and dressing rich in milk products and anchovies. This is the real deal. I’ve already tried a couple of the recipes off this site which turned out quite nicely, but this recipe converted to me ! I love this chef and wish her and her family (+baby) all the best in the world this next year! that makes me so happy! Thank you for your feedback! Made it yesterday and it got a thumbs up from my whole family and even from my boyfriend! It was a really delicious salad! Thank you for the amazing recipe!! This salad was a starter of our christmas dinner – it’s just divine. The roasted chickpeas are delicious and I have used them as a snack and for another salad a well. I’ve just recently found this blog – thank you for your great work. I love this recipe and it really is crowd pleasing! I made this last night with dinner and everyone liked it. Even the most stubborn meat-loving person at the table said it was good. I did find that the chickpeas could have been crunchier. Maybe they could have sat in the warm oven a bit longer…? Thanks for putting this recipe together! My boyfriend make this recipe for me one day for dinner… Now he have to make me this salad 2x/week absolutlely !!! Amazing amazing…A thousand time better than any caesar salad I have ever tasted. I live in Berlin and have been able to find Lacinato Kale “Schwarzkohl” in Denn’s Biomarkt recently, but I think the salad would be just as good without it. How long will this dressing last in the fridge? WOW! I just made this for lunch and it tastes better than any caesar I have had! Since going vegan, I have been unable to find a healthy dressing that comes close to this. I was afraid to use the Worcestershire but provides that distinct flavor that is missing in other substitutes. Yet another recipe of yours that I will keep! I couldn’t find any locally either so I used Braggs Aminos. I can’t compare it to the original since I’ve not made it with the Worcestershire, but it was delicious with the substitute. Good luck! My pick for 2014 too! I have to say I almost never make a recipe twice but this one is the exception! It’s so good that my boyfriend requested we start a list of to-make-twice-recipes :) Love the nutritional addition of the seeds and nuts in the “parmesan”. I misreaded and used sunflower seeds instead of sesame and it tasted super great. Will try with coconut bacon because i’m sure this salad will be eat for the third time soon. Thanks Angela for your always helpful blog :) I’m from Québec and it’s nice to read a vegan canadian blog ! You say you add kale for a “nutritional boost” but romaine lettuce is just as nutritious as kale- can you elaborate on how you find kale to be more “nutritious”? This is literally my FAVORITE thing to eat! I will have this at least once a week. Even my non-vegan husband loves it. The dressing is great on a lot of other dishes, too. :) Keep up the amazing work! Made this three times over the holidays. DELICIOUS. Always a huge hit. I like it much better than the “classic” salad. The kale makes it so much more delicious and the dressing is so good I could drink it. I had this recipe filed in my brain as “to make” for several weeks. Then it was featured in your Most Popular Health Recipes of 2014 post, which gave me the extra shove to just make it already. I followed your recipe with one exception – I used Braggs Aminos in place of the vegan Worcestershire (none at my local market). I did add the optional Nutritional Yeast to the parmesan blend. The flavors and textures of this creation blend BEAUTIFULLY! I’ve roasted chickpeas a dozen times but never at so high a temperature so I was a little skeptical. But that high temp transforms those little buggers into light, airy little nuggets of crunchy joy – making them really taste like croutons. It was weird and awesome at the same time! Thank you for sharing so much with us, this recipe included. Even my 10 year old traditional-Caesar-salad-loving-boy was loving the “anchovy” tang! He didn’t believe there weren’t any in the dressing. Your cookbook has been my bedside read since Christmas (thanks, mom) and I thank you for doing what you do! Just made this salad! So delicious! Thank you, Angela! I made this recipe and brought it for Thanksgiving dinner-it was delicious! Your website is my go-to for great vegan meals. I received your book for a Christmas gift and noticed a similar chakra caesar salad recipe. Just wondering which dressing recipe you prefer…I haven’t made the one in the book yet. Thanks for all the great recipes and congrats on your sweet baby girl! this one is my new fav. :) hope you enjoy! Alison, how do I adapt the Vegan Sour Cream recipe to translate into the dressing. Made the sour cream yesterday with ingredients mentioned above (was fab with the chilli and have a cup of sour cream left and no chilli – it was THAT good ) but wondering should I add more water and then other ingredients to Caesar it up? I try not to stop my children from eating veggies, but I had to tell my 6 year old to stop stealing the lettuce and dipping her fingers in the dressing. She also loves the chickpea croutons. Such an awesome salad, and right now I think my favorite. I will be making this many many more times. Thank you! Just made it tonight and both hubby & I raved about the taste, texture and combination of ingredients. Delish and thanks for sharing! What an amazing salad. Made it for New Year’s Eve. Could have doubled the recipe. everyone loved it! This has become a weekly favorite in our household! I had been on the hunt for the perfect vegan Caesar salad dressing and this is it! 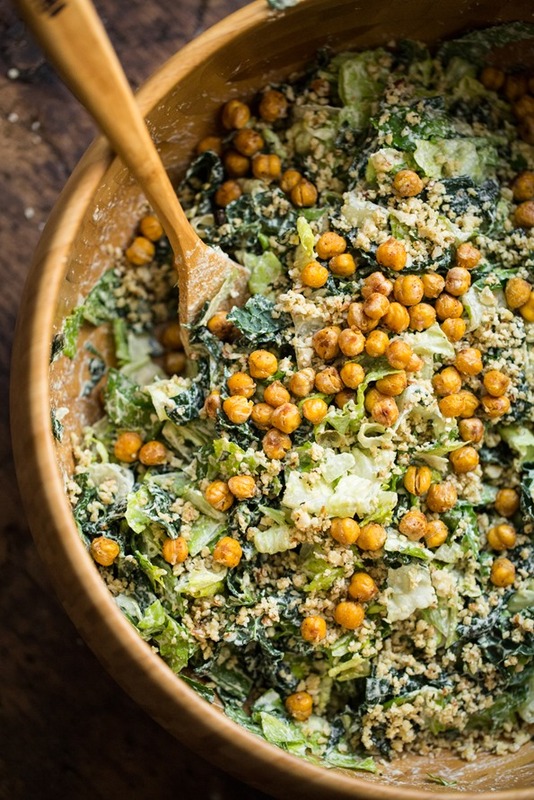 I love the crunch of the chickpea croutons as well as the mix of romaine and kale. Whenever my husband and I are craving something healthy but, feels decadent, this works every time. Thank you Angela!!!! I have cashew meal (from some random thanksgiving baking) and I have been looking for something to do with it. Do you think I could use it instead of whole soaked cashews? I have the oh she glows cookbook and this vegan Caesar salad is not in it what cookbook is this in. I just made this and I’m certainly going to be making it again soon. I think I’ll also make the chickpea croutons and parmesan mix to add to other recipes as well. Thank you for wonderful blog! This was AMAZING. I don’t miss much from before I went vegetarian/mostly vegan, but classic Caesar salad is one thing I miss tremendously. I’ve enjoyed Annie’s and Trader Joe’s Goddess dressings, but this is SO much better. Thank you for the recipe and awesome site!! Tried this today, and while a bit on the salty side, it was delicious! 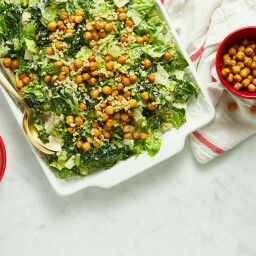 Made your cookbook version of this (Chakra Caesar Salad) for family (who are not vegan) visiting during the holidays and it was so popular, we made it 3 times in one week! This is our new favorite go to salad – perfectly balanced flavors! This is AAAMMMAAAAAAZZZING! I really love the cheese i would consider using it warm on pasta on brushetta or ontop of mushrooms. I am going to double the dressing and cheese ingredients next time and use half for other foods. great job! I tried this out last Sunday as an accompaniment to pizza (vegan for me & meat for everyone else). I was somewhat doubtful-I have tried lots of vegan “dairy” versions of things and I would say 90% of the time it is a fail. But it never stops me from trying! So I roasted my garbanzos & started cashew soaking. The garbanzos that came out of the oven were fantastic-it was hard not to eat those at once. Finally, with cashews done I made that and it was fantastic! So I decided to go ahead with the “Parmesan” and to my surprise the flavor it added was perfect! I tossed everything together and it was a total hit. The only thing I would have done differently is not roasted the garbanzos so far ahead of time as by the time we went to eat the salad they were chewy. My fault-I haven’t roasted them too often so I didn’t realize I needed to do those closer to the actual serving of the salad as fresh out of the oven they were wonderful. This salad was a hit with everyone-no one could even tell it was vegan! Really creamy & lots of flavor. I will definitely be making it again and again. Delicious salad! All components were great, although I would double the dressing for the amount of greens recommended-it’s so yummy that I wanted it to be well coated. Croutons were good too, but I had to leave then in the oven on low heat for way longer in order for them to be crunchy, otherwise they felt a little chewy. I will make it again! I’d love to make this but I like to make a big salad on a Sunday for a few days at work – what would be the best way to store this? Could I prepare the greens with the “cheese” and bring the dressing and chickpeas in a separate container? Thanks – it looks delicious! I had leftovers for lunch today. I stored the cheese and chickpeas separately in the fridge, but put them both in the same container as the lettuce this morning when I packed my lunch..dressing definitely on the side. I couldn’t tell a difference from when we had it last night, though I probably could have added the cheese and chickpeas to the lettuce for storing in the fridge, too, and still not noticed a difference. Brilliant – Thanks so much for your help Caitlin! Made this for dinner and it rocked, even my husband that loves traditional egg based Caesar salad said it was delicious. The cashews give it a fantastic texture and bring a real creaminess to the dressing. Will definitely go on my make again (and again and again) list! This is amazing. I’ve made it several times and love it. I was wondering if anyone has tried freezing the dressing? I’d like to make a bigger batch. I freeze the dressing and it comes out great! Brilliant recipe. A new family fave. I made this for dinner the other evening and it was a huge hit! Made this last night and loved it!!! Also ate it for lunch today :) added cucumbers and red peppers. I made this salad for Shabbos, and it was absolutely delicious! My guests (non-vegan-non-vegetarian) loved it, the sauce was amazing, and the vegan parmesan unbelievable cheesy… yummm! Totally worth the effort and God knows how much I hate washing up my blender! A winner! I will definitely make this again! Fantastic recipe! I’m a newbie to vegan food and this was a perfect way to try a cashew based sauce. The whole family loved it. Thank you very much! This recipe was absolutely fantastic. The dressing tasted even better than traditional Caesar dressing. I loved the crunchy chickpeas and the vegan Parmesan, as well as the mix of kale and Romaine lettuce. As an added bonus, the recipe came together more quickly than expected. I didn’t mix mine in a big bowl (rather portioned it out to take for lunch during the week), so I’m not sure how the proportions would work out if I had mixed it all, but when I make this again I think I will double the vegan Parm. This one is going to be a staple in my kitchen! Really delicious..great “convert dish” — you can’t tell the difference in taste from a traditional Caesar salad, but you can boast that this version is much healthier and cruelty free! I should add my fiancé actually prepared this, and he said it felt like a lot of work for a salad. In my view, though, it was totally worth it (hehe easy for me to say when I am just the one eating it)! Just tried this for the first time and loved it! Didn’t have any worcestershire sauce so I subbed in soy sauce instead. I also didn’t have capers so omitted those. It turned out absolutely delicious! I’m not a vegan but actually far prefer this to traditional caesar salad. I just made this today, and it is SO GOOD! I’m gluten/free, dairy-free, and can eat very little meat,and Caesar salad is one of my most-missed dishes. You’ve done a great job making it healthier and somehow tastier! Even my old-fashioned mom loved it. Thanks, Angela! Hi there, just want to say I refer to your web site a lot and enjoy many of your ideas and recipes. I am making the Caesar dressing and just want to know how long it will keep in the fridge, I guessed about a week or so? Hi Fiona, I’m not positive but I would guess it would keep in the fridge for 5-7 days, possibly longer. We always eat it up by then, haha! Thanks for sharing this recipe. I made it this weekend and really enjoyed it. I substituted soy sauce for the Worchestershire sauce because I could not find any of the W sauce that didn’t contain anchovies. As a longtime vegetarian, ceasar salad is my dirty little secret but now I am trying to eliminate the anchovy component of it. Thanks for the inspiration! Hi this is your non vegan reader who has been cooking your recipes for almost 2yrs now. My hubby is on the low starchy food diet as well. Your salads and soups has been a hit. I’ve made this now- 4 x your portions for him. I didn’t say he didn’t eat loads. I love, love this recipe as I actually don’t like the normal Caesar salad recipe anyway. But this is such a winner that I am eating it as well. Thank you for all your continued inspirations. For a non- vegan, I am sure converting a lot of meat- eaters to your food. People seem to think vegan food is so boring but your recipes are always so colourful, taste wonderful and fills you up ( which is super important to us ). Oops forgot to day I had to double the recipe for the dressing/ cheese to dress it. I also used baby cos because we don’t have romaine lettuce in season. Or the organic store said they didn’t have it anyway. This looks amazing!! I am new to vegan cooking and still learning about a lot of things. Two quick questions…if I can’t find Lacinato Kale would you recommend something else in its place? Would other kale be too strong? Also for the chick pea croutons how do you buy those? I am normally used to buying them canned but can they be dried or? Sorry these may sound silly but I gotta start somewhere! Thanks! Just found you (luckily) and have made a few recipes so far. I have devoured them all. Made this on SuperBowl Sunday and we devoured it. Thank you! I made this tonight and it was amazing. Made it exactly as written and it was fantastic. My husband was dubious about the idea of a vegan Caesar salad but he is now sold. I am now tempted to try adding the king oyster mushroom “bacon” I saw on the Food Lab recently to add a touch of smokey goodness. I constantly play around with vegan caesar dressing and have been meaning to give this recipe a go since you posted it. We LOVED it! I subbed about 2 tablespoons kalamata olives instead of capers (didn’t have any) and used 1/2 cup chickpeas and 1/4 cup soaked cashews and 1-2T extra lemon because it was a little thick from the chickpeas. SO GOOD! This was really delicious, a table full of meat eaters plus a vegetarian all said it was the best Caesar salad they’d ever had. Will make again, really glad I doubled the recipe for leftovers! This salad is amazing. Completely amazing. I am considering making a big batch of this for my wedding this year… Any idea how long the dressing would keep if I made in advance? Sounds delish, really excited to try! I have made this dressing twice now and it is one of my favorite! Capers give it that caeser taste. This keeps in the fridge for a few days too. Great recipe. Chickpea croutons, what an excellent idea. And I love the salad bowl in those photos! I have become OBSESSED with this salad and so are many of my friends who have tried the recipe!!! It’s ridiculously good and well worth the different components that need to be prepared. I am salivating over this! Love your site!!! My kiddos cannot do cashews :(. Do you think I could sub the cashwes for coconut milk in the can in the fridge? And, a sub for the parmesan cheese portion where it calls for nuts, would this be okay with no nuts or is there another sub?? Thanks so much, congratulations on baby and book and new ventures! Hi! Does anyone know of the nutritional information for this salad? WOW! I’ve just made something similar – using your dressing. Yumm! What an incredible recipe Angela! I used Hendersons relish which is a british sauce (vegan) similar to WS, delicious! Great recipe. Due to cashew allergy, would you recommend macadamia nuts or almonds as replacement? Wait, I’m kicking myself for not making this sooner. It is sooo delicious, filling, and healthy. Now I’ll be making it weekly! We just dialed in this recipe tonight and combined it with Beyond Meat’s Seasoned “Chicken Strips” and it was amazing!! This is a solid lunch or dinner connection. Great recipe Angela! This salad is so delicious! I made a double batch to go with our Easter meal, and extra dressing, which I’ve been using in my veggie wraps. Yummy! I made this to take to dinner with my boyfriend’s family. It turned out fantastic and I liked this dressing better than the one in the cookbook (though that one was awesome too!). It was so good that my boyfriend’s dad says he is scared they may start eating vegan foods even when we aren’t there! :-) A high compliment in my book. Thanks for such a wonderful recipe! This looks amazing! My mouth is watering just reading it. I love Caesar salad! The one in your cookbook is a staple in my house now. I definitely will be trying this. The idea of chickpea croutons is genius! I really want to make this salad ! This is so unique! You’re recipes are amazing! Best salad I’ve had in awhile. I am absolutely obsessed with the chickpea crouton idea! This looks just about perfect!! My husband loves Caesar Salad, and this one might the one that gives him a more positive perspective on eating vegan! Thanks! I need to make this! I used to love Caesar salad with the creamy dressing, and I’ve missed it since I’ve stopped eating dairy and stuff! I make this recipe often and never get tired of it! I use the chickpea croutons in my Buddha bowls too. Thank you for sharing a vegan version of the caesar salad. It’s one of our favorites. This looks like a refreshing and so delicious salad, great for when hosting a party. Would be gone quick too. You really can’t go wrong with roasted chickpeas! Great recipe! This is a life-changing Caesar Salad! OK, maybe I’m being a bit dramatic, but it is awesome! I find myself craving it! I have made it for several parties and everyone I served it to raved about it (and none of us are vegan). It is definitely time-intensive to make though so now that I know it is a keeper, I make large batches of the dressing and freeze it. Still tastes great after freezing. I think I’ll try freezing the nut and seed topping as well and see how that holds up. I would eat this just about every day if I didn’t have to prep it! I can’t wait to try this! I am always looking for a good home made vegan dressing for salads and this one I must try!! My sister and I are obsessed with this salad! We’ve been making it at least once a week… It’s the best caesar ever (vegan or not). And with kale! A woman after my own heart. I have still yet to try roasting garbanzo beans. Love caesar salad! Love chickpeas and like even better the idea of roasting them and using them as croutons! Duh! Light on please! how is prep time 45mins, but you have to soak cashews over night or at least a few hours. its not exactly an optional step as the dressing is sort of key to this whole thing. Could this dressing be made in a larger quantity and stored in a salad dressing bottle in the fridge? Do you have any thoughts as to how long it would ‘last’ this way? Eating this as I type! Great recipe. I’m going to serve this at my next party for sure! This is THE BEST caesar salad I have ever had! The caesar dressing is a keeper on its own and I will never be buying store-bought again! omg, i have been searching for a vegan caesar salad since i became vegan 8 years ago — this is it!!! finally made it today. thank you! AMAZING!! A friend of mine has made this several times and it is always a bit hit!! You would never guess this doesn’t have cheese and the flavour is perfect caesar! I am going to attempt in myself soon, just need a replacement for the cashews since my significant other is deathly allergic!! Maybe you could try it with macadamia nuts? Not sure but it seems like they may be a good substitute. I just made it with the cashews – although I didn’t have capers so dropped two olives into the blender instead and I have to say that it was the beet caesar dressing I’ve ever had!! Making it today, we are on vacation so I’m feeding 2 vegans and 13 non vegans! Thank you! Any suggestions of what to add to it to make it crumbly? Mmmmm, I made this salad for a get together that included folks with a variety of dietary restrictions. Everyone there could enjoy it, it went over very well, and now I’m OBSESSED with it. It’s soooo delicious. Thank you! Just made the caesar dressing for this and WOW Oh WOW – is it good!!! Ten times better than other caesar dressings I’ve tried in the past! Thanks so much for your recipe!!! Garlicy, creamy, but not in that heavy kind of make you want to throw up way, mmmm soo goood! I have dreams about this recipe. Really Angela?? How is it that you’re able to create one amazing recipe after another?? Made this for supper the past 2 nights- so good!! I try to do a salad night twice/week and my partner usually obliges but resists and this one was a home run! Hi Angela! Just finished making the Caesar salad with the nutty herb croutons from your book “Oh She Glows” for the third time (each time doubling the recipe) this summer! OMG are the nutty herb croutons ever good! Our family just loves it and I have to agree, it’s hard not eating the croutons when they just come out of the oven! :) Thank you for another amazing recipe! I finally made this tonight. It was so freaking good!! So glad I doubled the dressing and have more greens in my fridge. This was absolutely spectacular! Especially with some coconut bacon mixed in. So, so good. I just made this! Incredible. I am so grateful for your blog! Thank you. I finally got around to making this after ages of it sitting on my Pin board and it totally did not disappoint! My 7 year old daughter said it was awesome so I think that’s a slam dunk :) I added marinated seitan, steamed asparagus and pine nuts and I did not soak my cashews as I had not prepared in advance to make this, but in my Vitamix it all blended up perfectly. I had to get right up and make those chickpea croutons. They’re not gonna make it to any salad….they may not even live to cool off! And I’m dreaming up the next flavors: curry, garlic+onion, lemon-garlic…m-m-m! My new protein treat! Well I’m so happy to hear I got your first internet comment ever! haha. Thank you for the review! Made this salad and it was a huge hit! The dressing is unreal. How long does the dressing last in the fridge? Thanks!! This is my favorite salad. I have made this recipe several times and everyone loves it! I’ve recently bought your cookbook and am in love with it. I have a question borne from ignorance: can roasted cashews be used in place of raw cashews in the dressings and sauces? I am allergic to raw cashews (burning sensation in my gums and digestive tract) but have no issues with roasted. This was delicious! How long is the dressing good for in the fridge? This is my first time using one of your recipes and making a dressing from scratch. It was absolutely amazing! My un-vegan fiance was obsessed with it and said its better than the regular dairy-based dressing! I am not a fan of salads but after this,I’m going to try all of your salad recipes! I haven’t had ceasar salad in a LONG time, but I used to love. I don’t make it simply because I don’t keep mayo around anymore. I try to make most of our condiments and mayo was one that went by the wayside. This tasted like real dressing! I was really surprised. Both my bf and I really liked it. I realized halfway through throwing things in the blender that I didn’t have Worsh. sauce. But I read that you could sub 2 tsp of soy sauce/tamari and a pinch of lemon juice and sugar, so I did that. I’m not vegan, so I realized after I could have used anchovy, but it was great as is. I’d love to try it with roasted chickpeas. Is there a reason you can’t make the roasted chickpeas the night before? I am traveling 2 hours on thanksgiving day and it would help me immensely if I could roast them the night before and put into a covered container for travel. I would like to get to my destination and just be able to assemble it without having to use the host’s oven. Thank you so much for this amazing recipe. I made it as part of our Thanksgiving meal and everyone loved it. It looks so pretty too! My husband says it tastes like a “real” cesar salad from a fancy restaurant. I will be making it again! Amazing. Made it two nights in a row. I love Caesar salad and this is by far the best one I ever had! Fabulous!!! I was missing my old ceasar dressing! I substituted balsamic for the worcestershire. Highly recommend trying that modification as well. Thanks so much! I made this as part of a vegan Thanksgiving, for my vegan daughter. The “fake cheese” was the big hit. We had plenty left over, since it was just the two of us, and we’ve found a dozen ways to use it. I’m back here not to leave a comment but to get the recipe again so we can make another batch. THANK YOU! BEST Caesar dressing ever- vegan or no! Omg! I made this tonight for a quick dinner and HOLY S#^+ was it amazing! I’m new to the vegan world and am still testing the waters, i.e. seeing what I can pass off as a non vegan dish to my husband, and this was perfect! He never new the difference and even thought thi was the best version yet. Thanks bunches!! This salad lives up to its name! I made it for Thanksgiving and my non-vegan sister asked for the recipe. She made it for another holiday party for non-vegans and said everyone loved it! I plan on using this dressing for other salads as well – it is so creamy, filling and satisfying! Thanks for this amazing recipe. Love love love this salad! I made it for Christmas dinner and everyone really enjoyed it. I’ve been eating it every day since. I can’t believe how much it tastes like regular caesar salad! First of all, this is amazing and truly a crowd pleaser. Vegetarians have the option to use parmesan instead of the nutrition yeast + nut mix, which we did. If you don’t soak the cashews in advance, boil the cashews for 15 minutes and let them cool. They’ll be soft and ready for blending. I’ve used this trick on a few Oh She Glows recipes and it’s always worked beautifully. It avoids the “oh crap, I didn’t soak so I can’t make this” situation. I just made the Chakra Caesar Salad from your book and we love it. I did find it really thick and wasn’t sure if that is as expected or if I needed to add more water. Now I see you have this new version that uses cashews rather than almonds. I have a few questions and if you or any of your followers are able to answer that would be fantastic. 1) Chakra Caesar Salad – is it supposed to be very thick (not runny at all)? 2) Between this posted version and the book version which one is better? 3) Both versions – how long can you store them in the fridge? Thank you Angela. I absolutely love your cookbook and Ive tried about 15 recipes so far. Each one is a hit. We are not vegan but like to switch it up and look for more reasons to increase our vegetable intake. I’ve had this on my “To Make” list for quite some time and only got around to finally making it tonight for dinner. Oh my gosh… it is fantastic. I’m a huge caesar salad fan/connoisseur and I had my reservations, but this may be my new standard. Thank you so much for the recipe!! I’m so excited to make it for friends and family when they come over. Absolutely amazing! I made this salad for Dinner tonight and the crowd went wide! Thank you for posting! This is the best caesar salad I have ever eaten! My husband and I devoured it! I will definitely be making this again! Thanks! Oh my goodness, this was absolutely delicious! This was my first attempt at a vegan caesar dressing and it was delicious! Everything about this salad was heavenly delicious. I made mine for a week of lunch meals and just kept the components separate in the fridge and combined each serving together each day. I was surprised at how well everything held up, even the chick pea croutons. They weren’t super crispy after a day or so, but were still delicious! I added some whole grain fusilli pasta and chopped roasted almonds to add a little more protein to the meal and it was so great. I think a pasta salad with this dressing would be amazing as well! This looks so good – my mouth is watering! We love Caesar salads but haven’t had them in a long while because, well, too fattenimg. I’m going to try the chick pea croutons tonight! Thanks for the inspiration ?? I just made the caesar dressing, and I can’t believe how delicious it is! I was literally licking the spoon! It tastes just. like. caesar. dressing! The only modifications I made were that I added 3 cloves of garlic instead of 1, I added white miso instead of vegan Worcestershire, and I doubled the quantity of water simply because I like my dressing on the runnier side. Can you freeze the caeser dressing, to use again later? A major hit, and I haven’t even added the chickpea ‘croutons’ yet. I’m cooking for a family who is doing alot of vegan experimentation right now and one member is also celiac. A friend of mine mentioned her vegetarian friend cooked her alot of lovely things from the cookbook so I thought I’d try. I don’t yet have nutritional yeast and was short on time so didn’t do chickpeas, so I thought we’d just serve with real cheese (since we aren’t completely vegan yet) and toasted pepitas. The dressing is so good and flavorful that we ended up skipping the cheese altogether! We have a foodie family and I am very hard to impress as far as innovative and tasty new recipes, so I’m converted. Yes, the recipe has been slightly modified in recent weeks. Hopefully, if you give the new version a try, you’ll agree with me that this topping is even more flavourful! Wowzers. This was truly crowd-pleasing! I took it to a potluck last night, and everyone loved it. When I told them that it was vegan, they were all shocked! So so good. Glad to hear the recipe was a hit, Laura! Angela, what a hit! I can not believe how delicious this caesar salad is. A new favorite in my house and with my friends. Made this today for Easter Brunch. Two thumbs up! I’m glad to hear you enjoyed it. :) Happy Easter, Taryn! Creative and delicious spin on the classic Caesar salad. I made this for our family Easter lunch. Everyone went back for seconds, even my brother-in-law who doesn’t like kale! Hey! 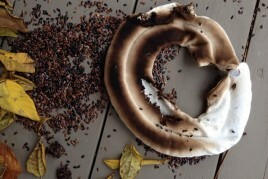 Thanks so much for your beautiful website, to-die-for cookbook and awesome blog posts. You rock! I’m wondering, since I’m a single lady, and often just cook for one, do you recommend only roasting the amount of chickpeas you want on the salad? They’re probably not great the following day, hey? Hi Meg, sorry for the delayed response on this! You can definitely roast just a single serving of chickpeas. Or, if you make a full batch and end up with leftovers, you can let them cook completely and then pop them in a container in the freezer; they’ll keep well there for about 5-7 days. To reheat, simply place the frozen chickpeas on a baking sheet and roast them at 400 degrees F for 5-10 minutes. Hope this helps! Why do t you put one teaspoon instead of half a tablespoon? Hi Bridget, great question! Half a tablespoon is slightly larger than a teaspoon: there are 3 teaspoons in 1 tablespoon. Hope this helps! Aw, thanks for the awesome comment, Margaret. I love that your dad loves it so much!! This was UNBELIEVABLE! It is my go-to salad now for parties. My non-vegan friends will eventually stop giving me grief and finally accept that plant-based eating is good for you AND delicious. Thanks! My girlfriend and I just made this and we loved it! Looking forward to sharing it and having leftovers tomorrow. We don’t have a food processor so just made the cheese in the vitamix – it worked out fine. It’s now added to the rotation with the enchiladas and the chickpea salad! I’m glad the recipe was a hit, Brendan! It’s definitely one of my favs (along with the other two recipes you mentioned – sounds like a great recipe rotation to me!). I hope you enjoy whatever you try next just as much. This looks divine! Do you think I can substitute white beans for garbanzo? or possibly fava? Hi Laura, I haven’t tried it yet, but apparently you can roast other beans in lieu of chickpeas. If you try it out please let us know how it goes! How long does the dressing keep in the fridge? Hi Emma, I’m not 100% certain (we always eat it too fast! haha), but I would guess it would keep in the fridge for 5-7 days, possibly longer. Can you recommend the best substitute for hemp in this recipe? It’s actually illegal to ingest it in Australia (crazy I know….)!!!!!! Yes I know Tanya, I own a organic good store and café. I can’t sell a meal made with hemp seeds as its illegal to ingest in Australia (despite everyone doing so), which is why I asked what might be a good alternative. Did this recipe used to call for sesame seeds? Am I crazy or is it not listed as an ingredient anymore? I just made this recipe the other day and it is Ahhhhh-MAZING! I intend to make it for my next dinner party. …and all the time in general! This was excellent! Absolutely amazing Caeser. Will be included in my new repertoire! This salad is DELICIOUS!!! I cannot get enough of it! I have eaten it for lunch almost every day for the last two weeks and again for dinner at least 5 times. It is so good! Bravo!! Hi Tanya, it’s great to hear the salad was a hit!! Enjoy those leftovers. What an amazing, amazing salad! I made this over the weekend with your Butternut Squash Man ‘n’ Cheeze and it was quite the combo! First time my boyfriend has eaten kale so I was a little worried, but he loved it! I made the salad as it with no subs. He said the salad was so good and that he will definitely eat it again :) I am new to following your blog so have been so pleased with all of the recipes I have tried so far even though I’m not vegan/vegetarian. Excellent! So good we had salads with this dressing two nights in a row. I brought this salad to my sister’s wedding shower yesterday, and it was a HUGE hit. It’s certainly worthy of its “Crowd-Pleasing” title, and I can’t wait to make it again. As always, thank you for the wonderful recipe, Angela! I see in the dressing and “parmesan” cheese you add both raw garlic and garlic powder. Please explain why the combination instead of one or the other. Thank you. Made the salad dressing and loved it! Used 2 cloves of garlic. So glad you enjoyed it, Peggy! Made this exactly like the recipe listed and it was SOOOO delicious. I’ve made chickpea croutons one other time and they were totally grainy, but this time I left them in the warm oven to cool and they were incredible. This was my first time using soaked cashews in a recipe and the dressing was so delicious! Such a great recipe. My husband loved it as well. This looks delicious! I’m having people over for dinner Sunday and will definitely try it. It looks like it’s probably not big enough to be a stand alone entree though. What would you recommend as gluten free an accompaniment or entree to go with it? Hey Christina, I think this may be getting to you too late (so sorry! ), but there are so many great possibilities that I’m sure what ever you ended up doing was fantastic. For future brainstorming, soup and salad is always a classic pairing, and some gluten-free/gluten-free-option soups that I think would make particularly great accompaniments to the Vegan Caesar Salad include my Summer Harvest Tortilla Soup (The Oh She Glows Cookbook p. 135), 10-Spice Vegetable Soup, and Cream of Tomato Soup (p. 141). My Favourite Vegan Chili would also work well. Another “lighter” pairing option I’d recommend is my Crispy Smashed Potatoes with Avocado Garlic Aioli. For entrees, you could again go the classic route and serve the salad as a pasta accompaniment (for a killer tomato sauce recipe, I highly recommend my Fail-Proof Marinara Sauce, p. 175 from Oh She Glows Every Day) topped with my Cashew or Pepita Vegan Parmesan (p. 267). This is the best dressing I’ve ever had. I think I may have it everyday for the rest of my life. Even my 2 year old devours her salad! I don’t even need the vegan parm and have yet to make the “croutons.” We can’t have citrus so used 1 tsp of white vinegar. I also tried it with half the oil and was amazing!!!! LOVE this!!!! This dressing is AMAZING! I am trying to eat more veggies so last night I googled salad dressings and recipes. For some reason I’m really craving a chaser salad (probably bc I’m a salad novice and I want to ease into this new salad spree) I’m so glad I made this! I forgot to buy a lemon and added an extra garlic clove bc I ran out of garlic powder. I was literally scraping out the blender and licking it clean. Thank you! So glad you enjoyed it, Abby! Tried this last night with my mom, and we thought it was spectacular! I don’t know how you managed to create a dressing that was vegan and tasted better than the real thing. The only thing I might leave out in the future is the chickpea croutons, as I thought the salad was good enough without them. Thanks for an awesome recipe that will definitely be made again. Hi! Can you sub the Worcestershire sauce for anything? Thanks! Hello. 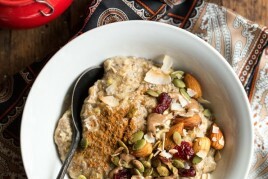 My question is do you soak all the cashews for this recipe?! Including the cashews for the parm? I’m allergic to cashew … could I use walnut, almond , or sunflower seed ? This was so good! I think it’s better the next day after it’s been chilled. BEST DRESSING! Even my non-vegan friends prefer this recipe and ask for it all the time. Best part is, a pre-dressed salad can sit in the fridge over night with next to no wilting! You nailed this recipe, I make it often. Thank you for all your recipes! Truly Wonderful. I’m making this for Thanksgiving, looks great!I was thinking of adding some roasted Brussel sprouts and doing just kale and no romaine since I find romaine bland, do you think that would work? i am very excited to make this for the 1st time as i am bringing it to a dinner party at our friends house and they are vegan. can i make the whole thing ahead of time? if not…what are your recommendations for prepping ahead of time? Hi Kristen, I’m not sure when your dinner party was—apologies if this is coming too late! Although I find this salad is best served immediately once it’s all put together, it’s a great make-ahead salad because you can prep everything separately the day before (except for the roasted chickpeas) and then just mix it up the day of your event. How important is the nutritional yeast in the dressing? Is there something else I can sub, or can I leave it out? I follow the Medical Medium vegan diet, and he says nutritional yeast is pure MSG, so I don’t consume it. Hey Shannon, The nutritional yeast is used in the vegan parmesan cheese topping, and not the dressing itself. As the “parmesan” is really optional, you can definitely just leave it off your salad to avoid the nutritional yeast. :) Hope that helps! Yay! Thanks!! I can’t wait to make it. Your recipes are staples at our dinner table! When you say the dressing easily doubles for a large salad, do you mean that the recipe here makes double the amount already? Or you would have to double the ingredients for a big salad? Hi Diane, I mean that you can easily double the dressing recipe by doubling the ingredients for a bigger salad. :) As written, the dressing recipe is perfect for 5-6 small bowls. I hope that clarifies things! This was great! Tough to find vegan Worcestershire but if you live near a sprouts, they had it! As a vegetarian it’s tough to find a caesar salad, this one hit the spot. It is best for a large group to make all at once since you can’t really assemble too far in advance. I’ll make again! I made this last night for Christmas Eve dinner for my (totally non-vegan) family, and it was a huge hit! I hadn’t realized how much I missed caesar salads since going vegan a couple of years ago, and this compleeeetely hit the spot for me, too. THANK YOU! Hi Angela – I made your Chakra Caesar Salad with Nutty Herb Croutons from your first book as the starter for dinner tonight. The croutons were amazing! Something strange happened with the dressing. It was really, really think – more like a paste or a very thick dip. I added more lemon juice and olive oil and even water (which the recipe didn’t call for, but I was desperate!). This was my first time making this dressing. Any ideas as to what happened? My son, Nathan made this for our Christmas dinner. It was outstanding. Oh, I’m so pleased to hear that, Bettylynn. Happy holidays to you! This is seriously crazy delicious. I can take or leave the chickpeas (maybe just throw them in plain) but I could slather this dressing on just about anything! Made this last night … everyone loved it! One question: the roasted chickpeas were plenty crunchy when I took them out of the oven. Once cooled, I put them in a glass dish with a snap-on lid .. left them on the counter. All this the day before I served it. Next day, they were soft .. almost rubbery, or chewy. I expected them to stay crunchy. Did I do something wrong? I am so excited to make this recipe. I had a couple gal-pals rave about it, so now I have to try it. I have a question for you though before I make it tomorrow night for my boyfriend. Is the 1/4 cup of water that you indicate for the dressing intended to be put in the blender, or is that the amount of water to soak the cashews in? SO delicious! Yet another OSG hit(-: A crowd-pleaser for a dinner party last night. I am obsessed with this salad! I’ve eaten it 6 times in the past week. I will go as far as to say that not only is it the best Caesar Salad I’ve ever had, it’s the best salad I’ve ever had. I’ll be making this over and over again! Thanks for this wonderful recipe! Okay, so I have both your books and cook out of them all the time. Your recipes are amazing. This caesar dressing, though… It was a bit tasteless. I had to at least double (sometimes triple) each of the flavouring ingredients to get some bite out of it! Did I maybe use the wrong capers? I bought Non-Pareil, not knowing the difference, and perhaps they’re milder in flavour. Anyway, thanks for all the other amazing recipes you post. I loved this recipe and can’t get enough of it. Just wondering if it can be frozen? Hey Lydia, As a whole dish, this is best served immediately, but I think some readers may have tried freezing the dressing on its own with some success (though I haven’t tried it myself). I’d suggesting reading back through some of the comments to check for tips & tricks on that! I had two carnivores coming for dinner – one LIVES on dairy :) I could not figure out what to make for a side…this was AMAZING! They loved it, would never have none if I didn’t tell them. Thank you…this will be a go to for me!! Wow! This salad is crazy good. Even my omni picky family agrees. My 12 yo and I were fighting over the left over dressing. Thank you for the kind words, Kathryn! I’m thrilled you found this recipe and love it so much. 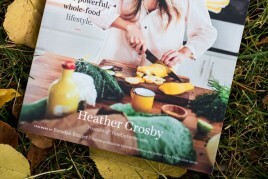 Hey Casey, You can the find nutritional information in this pdf, made up for the recipe as it appears in my new Oh She Glows Every Day cookbook: http://cdn.ohsheglows.com/docs/OhSheGlows_Every_Day_Nutrition_Info.pdf. It should be comparable to the recipe as it appears on the blog (though I believe it may not include the “cheese”). Hope this helps! I go to comment/review sections to see if people have actually tried a recipe or a product to see if it’s worth making or buying. But 99.9% time I get ppl saying, “oh that looks great and I can’t wait to try it”, or “I’m so excited to try this”, or “thank you for posting this blog” which is worthless to say the least….it’s really frustrating. Perhaps there is should be a separate section for ppl who actually tried and bought a product/recipe and another for ppl who are just “excited” about making them. I couldn’t agree more! Check out Minimalist Baker. After her (vegan!) recipes the comment section has 3 options – All comments; I made this; Questions – and only the folks who have made it can rate it. I could not agree more. That is my second biggest pet peeve about food blogs. My first is how you have to scroll down through a bajillion photos of the food from every angle and paragraph after paragraph of unnecessary text and cutsy stories about this and that before you can even look at the recipe. Give us the recipe first, then put all the photos and text you want later. I made this today for Easter lunch and just tried it and it is VERY good. All the components are great. Dressing is delicious and love the crunchy chickpeas! I only changed one thing, instead of Worchester sauce (didn’t have) I used soy sauce. Still came out great. I’m excited to take it to lunch and know everyone will love it as much as I do! Thanks for sharing, Janine! It’s great to hear the soy sauce worked out so well as a swap. Hope you had a happy Easter! I would eat this every day if I could! This is my favorite salad of all time, I’ve probably made it 10 times this past year. Thank you! I am seriously not a salad person. I avoid eating salads as much as possible but when my mom asked me to make a salad for my brother’s graduation, I thought I would give this a go. Honestly, now when I think of salad, I think of this salad because it is SO GOOD. It looks difficult from the amount of steps and ingredients but it turned out to be really simple if I made the parm and chickpeas in advance (they are great additions to other recipes as well). Whenever I think about cooking for other people, this is always on my potential menu because it puts other salads to shame, even non-vegan ones. Made this today. The dressing as delicious. Top notch. The chickpeas I wasn’t crazy about. They never got fully crunchy for me (just slightly crunchy on the outside) even thought I followed the directions exactly. The cheese was a total bust because I accidentally soaked the cashews for the cheese, not realizing only the cashews for the dressing were supposed to be soaked. So the cheese turned out pretty gross, but that was my bad. I’m gonna try to “dehydrate” the cheese on the lowest setting my oven will go to dry it out, then maybe I can salvage it. Totally worth making just for the dressing alone. Really great. Can you make the dressing without cashews? My son has a cashew allergy :(, any suggestions for a substitution? Hey Jen, I haven’t tried it (or at least I can’t recall trying it, haha), but raw soaked sunflower seeds might work. I would try using 1/3 cup to 6 tablespoons since they pack into the measuring cup a bit more densely. I’m just not sure how the flavour would turn out since they aren’t as sweet and tend to be more detectable in dressings. Please let me know how it goes if you try it out! I just posted a comment below about this… I made the sauce using raw unsoaked sunflower seeds and it was delicious. My kids love it both with cashews and without. Next time I’ll try making the parmesan with sunflower seeds. The best caesar salad. Followed the dressing recipe perfectly, except the capers, and it’s absolutely amazing. I’ve literally made this recipe on repeat for the past two weeks. YUM! Chickpea croutons delicious as well, but I didn’t try the parm cheese – instead I just sprinkled nutritional yeast on top. I love, love, love this dressing! There is a vegetarian restaurant chain in Ottawa that I enjoy and I’m convinced that they are influenced by you, and not only because a copy of your book is artfully displayed on a shelf. :-) I love their “caper vinaigrette” that they put on a salad that looks suspiciously like this one, minus the chickpeas. Your recipe surpasses theirs! I love to make fresh dressings at home and all of your recipes that I have tried have been delicious. Love the cookbook, too! Hey Christie, That’s too funny..I’ve actually heard this from readers before (in other restaurants, all over). I don’t blame them, really (lol). Thanks so much for your kind words, and for supporting my cookbook! I make the dressing all the time, at least a few time a month. I love it so much. I use it as a dip for vegetables, put it on sandwiches, and use it as my salad dressing. My only gripe is that since I eat it so often, I have to make it so often. Not that it takes long to make, I’m just lazy. :) I usually double the recipe and have often quadrupled it. Do you think this would freeze well if I would make it in larger batches? Hey Sam, You might be able to experiment with using more cashews and some water in place of the oil, but I haven’t tried this out myself. If you try anything please let us know how it goes! Hi, I’ve made this a bunch of times, but because I’m on the low FODMAPs diet right now, I made the sauce with sunflower seeds instead of cashews and it was almost as delicious as with cashews. Highly recommended! This has become my favourite dressing and dip. I do, however, put in 1/3 of a cup of Nutritional yeast and it sends it right over the edge in flavour. Thanks for the recipe! Can you freeze any leftover dressing ? Hey Brandi, I’m sorry I haven’t tried freezing this before! If you do attempt it, I might suggest trying to freeze a small amount in a freezer-safe bag, and then thawing it to see how it is before freezing a big portion. Please let me know if you try it! OMG! I have been missing Ceasar Salad and Carrot Cake with Cream Cheese Frosting. Thought I could not have these foods. I tried this recipe for the first time at our Canadian Thanksgiving dinner. The family loved it! This will become a regular in our new vegan lifestyle! I made this today and served it for Thanksgiving dinner. It was so, so delicious and everyone loved it – vegan and omnivore alike! This dressing and salad are definitely going on my regular rotation! Thanks for the great recipe. Hey Christine, Good call serving this as a Thanksgiving side dish! I find it always goes fast at a dinner party. Happy belated Thanksgiving! made this tonight and was pleasantly surprised at how much it tasted like true caesar salad. Thank you! We enjoyed it over the weekend too! I found myself saying the same thing (sometimes I forget if it’s been a while). So happy you enjoyed it! Best Caesar salad ever, vegan or not! I didn’t realize how much I had missed this type of salad. Now I want to eat it every day. I love garbanzo beans but was craving croutons instead. I tossed cut up bread pieces in the leftover oil that sundried tomatoes come packed in and baked them. I always hate to waste it. Turned out awesome. Thanks for a wonderful recipe!! Hey Amy, I’m so glad it was such a hit! We can’t get enough of it too :) I love your crouton idea…genius! This looks amazing. I was wondering if the dressing would keep well if I wanted to make a larger batch for the week. Thank you! Hey Danielle, I don’t think I’ve had the dressing in the fridge more than a couple days before using it, so I can’t say for sure. But it was fine in the fridge a couple days in advance. The dressing thickens when chilled, so be sure to leave it at room temperature to soften before using. If you try storing it in the fridge for the work week I’d love to know how it goes! Soooo good. Even better than I remember actual caesar salad being. And the non-vegans loved it too. More time consuming to prep but amazing for guests or a fancy dinner. Totally agree with you on that…I make it for special occasions when we have people over. That vegan parm on top is just divine! Hey Sharona, I haven’t tested anything else, but I read online that sometimes an equal amount of chopped dill pickle or green olive may work. I’m not sure though, it would be an experiment. You can try leaving it out and seeing if you can amp up the other flavour enhancers instead. Oh my heavens HOW I ADORE THIS SALAD!!!!!! Thank you for this and the rest of your gorgeous blog!!!! omg, best vegan salad ever! Made this for a holiday party and it was a huge hit! I just made another batch of the dressing to use on my regular salads. Thanks Angela!!!! Amanda that’s so great to hear :) thanks for trying it! GREAT recipe! Can it be frozen? Thanks! Hi Andrea, Do you mean the dressing? I’m sorry I’m not sure! The best Caesar dressing I’ve ever had, even my teenagers loved it!! That’s wonderful news, thank you! I strangely didn’t love the dressing – I thought mine was very bland and I had a hard time getting it smooth in my vitamix (maybe because it was such a small quantity?). Loved the chickpeas and the vegan parmesan cheese, though! Lil, So sorry to hear about the dressing, but so happy you enjoyed the other components! You can try adding more capers, lemon, Worcestershire, or Dijon to punch up the flavours to your taste. Can you tell me the nutrition for the ceaser dressing and the cheese? Hey Becca, Just wanted to let you know the nutritional info is now included in the recipe (just hit the + sign to drop it down). Hope this helps! I just made this recipe for lunch, and I can’t thank you enough! It was genuinely amazing, and I followed the recipe to a “T.” I have never been a huge fan of Caesar Dressing bc the store bought ones are always so tangy and “mustardy” tasting. Your dressing blended perfectly and I didn’t mind the Dijon mustard at all. Next time I’ll add some tomatoes and avocados, bc there will for sure be a next time. Thank you again!! Jules, I’m so happy to hear the vegan Caesar surpassed your expectations! I love your idea of adding tomatoes and avocado next time. Sometimes I like to make a Caesar wrap stuffed with this salad and my Crispy Breaded Tofu Strips (sometimes I add some BBQ sauce for a kick); it’s really out of this world! Hi! I am late to the party here but planning to make this over the weekend. Just wanted to clarify: do all the cashews need to be soaked or just the ones for the dressing? I’m guessing the latter, and that the ones for the Parmesan do not need to be soaked. Thanks! Hey Sophie, Thanks for clarifying! You only have to soak the cashews for the dressing. I hope you love the salad as much as we do! Urban Remedy definitely uses this recipe for their vegan Caesar salad. I hope they paid you !! Thanks for the heads up! I haven’t heard of them before so they haven’t reached out to me. Help please! Made the dressing as per measurements, and for my it taste I found it tastes too much like the dijon mustard..like it’s all I can really taste. How can I fix this? I don’t want to waste the whole batch of dressing. Cashews are expensive :( The parmesan came out perfectly and so did my chickpeas. I’m just having trouble with the dressing. Thank you in advance! Thanks for the recipe! This was simple and absolutely delicious!! Will definitely be making again!! I ended up adding more lemon and spicing it up a bit because it seemed to plain/cashew-y at first, but with a few adjustments it was amazing how close to the real thing it tasted! Good call on ramping up the lemon/seasonings…I’ve been doing that too. So glad you loved it! question is as first time soaking nuts, do I soak in a specific amount of water overnight? do I use the water in the recipe or does that water actually go in the dressing when making it? Hey Sue, Thanks for your question! Happy to help :) And so glad you’re trying this out…I hope I’m not too late! I don’t measure the amount of water I soak nuts or seeds in…I just make sure to cover the nuts/seeds by about an inch of water as they’ll expand/plump a bit when they soak. After soaking, I always rinse the nuts/seeds and then drain the water off before proceeding with the recipe. I hope this helps and please let me know how the Caesar dressing goes! Wow, this salad was fantastic! My vegan daughter found the recipe and I made it the next day. Everyone loved it, even the non-vegans! I omitted the hemp seeds and it still turned out perfect. Many thanks! Hey Cindy, Such great news that you all loved it so much…thanks for your review! I am not one to normally leave reviews but I had to on this recipe! I’ve been vegan for 19 months and my favorite salad before going vegan was Caesar. I’ve tried at vegan food places to find something that would satisfy the craving but nothing was the same … UNTIL THIS! Omg I could have cried when I tasted that dressing. Thank you!!! Aww Chavonne, thank you so much! Your comment made my day. Really wasn’t sure whether this would be able to live up to my standards (I LOVE Caesar salad) but this is pretty great. Was really happy with the result and would definitely recommend others give this a try. The Caesar dressing recipe is really great! So glad it was a hit, Jennifer! Thanks for your review. I love this dressing, not much of a salad person but I am with this dressing. Wanted to know though, how long is the dressing good for if it’s in a sealed container in the fridge? Hey Daniella, So glad this salad won you over :) The dressing should keep in the fridge for 5-7 days. Thank you Shannon! So glad you loved it! Hi! I’m so excited to have found this recipe, but am a little frustrated with my results :( I’ve tried this recipe twice now, soaking the cashews 8 hours on the first try and 12 hours on the second. I use. Vitamin and don’t typically have any issue with blending cashews to a smooth texture. Both times I’ve tried though, my dressing comes out gritty and the cashews won’t blend fully, even after 5 minutes of blending time. The flavour is great but the texture isn’t right. What can I do?! Please help! 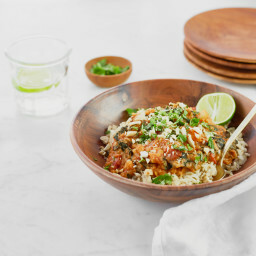 Could this recipe be made with almonds or another alternative to the cashews? I’m allergic and every vegan Caesar dressing recipe I’ve tried hasn’t been great so I really want to try this one! I’ve heard amazing things about it. Hey Jamie, I’ve been meaning to try this with soaked blanched almonds or even soaked sunflower seeds, but I haven’t gotten around to it yet! I think if you do try almonds it’s important to soak them to soften and use blanched (skinless) almonds so the dressing is smooth and not gritty. I’d love to hear how it goes if you try it out! I could eat this salad every day-it’s sooooooo delicious! I usually use more kale and add avocados sometimes too. Thanks! Hi! I am a new vegan and loving your recipes (I have both oh she glows books as my go-to on my counter).. I have not made this yet but I am curious about storage- would this freeze well? I was thinking of doubling the batch and freezing in an ice cube tray so I can pop one into salads in the mornings and have it ready to eat by lunch time? any thoughts? thanks!! this is my go-to salad & we are not vegan and all the guest i serve it to LOVE it and are so impressed by it. question for you…any suggestions on the chickpeas? i am making this for a teacher conference meal for the teachers & have to drop if off at school at 3:30, but the teachers are not eating it until 5. Just curious if you had an suggestions on keeping the chickpeas nice & roasted since they will be sitting for a bit. I’m so happy to hear that it’s such a hit Kristen! :) Thank you. As for storing roasted chickpeas, unfortunately I don’t know of a way to keep them crispy aside from reheating them in the oven just before serving. I wonder if you might have access to a toasted oven as a way to crisp them back up? If you don’t have any reheating means then I might suggest cooling them on the baking sheet and then placing them in a paper bag that allows air to escape (so it doesn’t trap moisture). They will definitely soften as they sit though. I’d love to hear what you try! I love this recipe! I seem to have overblended my Parmesan however. It is all balled up – any tips on undoing that? Hi Jillian, Hmm Im not sure you can undo that, hah. My advice would be to pulse it next time and check on it every several pulses to advice overprocessing. I hope it was still enjoyable! Just made the ceasar dressing and it was a hit! I followed the exact recipe except my vegan worchester was Annies. Delicious and my mother and adult daughter agreed. When measuring out the capers, do I need to drain the liquid or do I include liquid and all? Hi Cat, I usually spoon it directly from the jar and tap my spoon on the side to strain it slightly, but I’m not too fussy about it! This is the most amazing vegan caesar salad. Love it. Thank you so much for sharing it. This will be my go to salad. I am kind of addicted now!!! This was delicious! How long will the dressing last in the refrigerator? Hey there, it should last up to a week. Hope this helps!